The design area measures 10" x 12". The design is handpainted onto 13 mesh mono Zweigart needlepoint canvas. 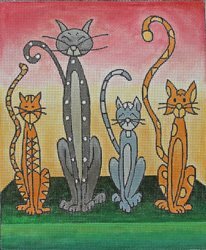 This cat needlepoint design can be purchased canvas-only or with fibers. If you select cotton fibers we will supply DMC embroidery cotton. If you select wool or silk fiber we will provide the luxurious Planet Earth boutique fibers. If you require stretcher bars we recommend a pair of 14" and a pair of 16" and some thumb tacks. This Laurie Ludwin cat needlepoint design is usually in stock and ships in one week. Contact us with any questions. We are always happy to help and usually reply within a few hours.